Rain and fierce wind on Saturday gave way to washed, blue skies on Sunday. Perfect for an afternoon walk around the bog. There's a hint of gold in the foliage, a portent of what's just around the corner. Hawthorn berries are turning rich red. Under the closed tree canopy, a cool trickle of water and dappled maple leaves could trick one into thinking summer is here to stay. But there, against the fence, in the open, there's no doubt about the season. Today, on the last day of August, Autumn waits in the wings while Summer sings her farewell. Beautiful, beautiful photos! Happy Mosaic Monday! A lovely walk and how pretty those brilliant red berries are! I think Summer has been singing a farewell here for some time. We seem to have gone into Autumn without very much Summer....maybe we will have an Indian Summer. Sweet Lorrie, thank you for taking us along your beautiful walk. The berries are quite lovely! Have a wonderful week, my dear. Hugs! Hello, lovely images. The last shot of the fall colors is pretty. It is still pretty hot here. Happy Monday, enjoy your new week! Beautiful photos taken on your walk. I don't want summer to end. But must admit those red leaves look they are saying good bye to summer. Beautiful photos Lorrie! Yes, one can really detect the golden tone to the foliage now and also a few pops of red or orange. Happy September to you. I hope the weather will be favourable to us all. Wishing you a lovely week Lorrie! Oh it is lovely. I do like the washing of rain. Beautifully written, Lorrie. I can see it too here but your photographs picture it so vividly, the lingering beauty of summer as we wait for the magnificence of Autumn. I love knowing Autumn is waiting in the wings. Beautiful photos Lorrie. Raining here today off and on, but we need it desperately for the gardens. We aren't doing much out there now - still hot, and mozzies out for blood - but we've decided late Oct.and Nov. will be when we go full throttle and do something worthwhile in our so overgrown garden. I can honestly say that I wish the hot weather here would lift and we could feel a bit of Autumn in the air...but it is hot, hazy and humid here....your coloured leaves look so pretty. A perfect summer to fall transitional post. And it seems like Autumn here already. I'm glad for the cool and we even had some rain. Needed! A beautiful post and perfect for celebrating the change of seasons! Gorgeous photos, Lorrie and full of hints of the autumn days ahead! Oh Lorrie, your late summer walk was just beautiful! I could swear that last tree thinks it's fall already! I was noticing that many of the trees around here are also turning WAY early! Beautiful walk. 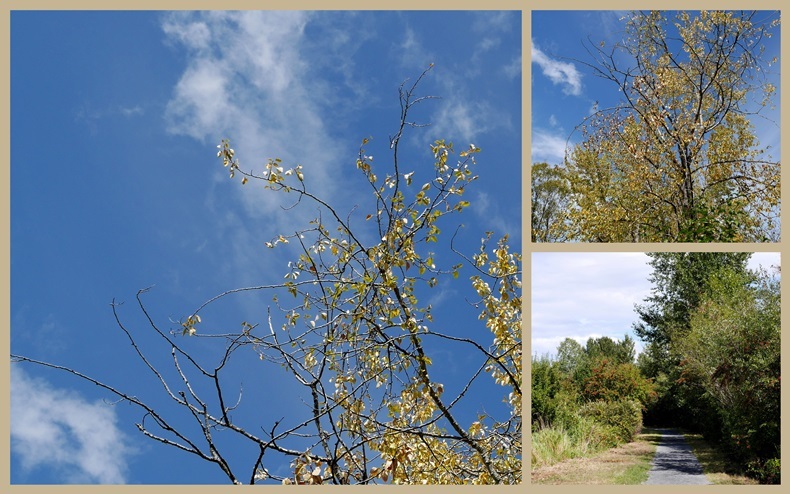 Loved the deep blue sky and the last photo of the leaves is quite spectacular. Fall is in the air! Normally I don't like that summer is singing a farewell, but enjoying the feel of fall coming around the corner this year. An adventure soon your way and hoping for the colors of fall. Lovely shots of those red leaves Lorrie...yes it's too soon, but then again it's always too soon isn't it? We have rain, had to share that ...because as you know, it's rather unusual to get it this time of year. I'm glad to hear that everyone has some. I enjoyed seeing your late summer pictures Lorrie and the five or more. Lucky you to have to have the children visiting! Love this post. The signs of autumn are on the trees here too, just a hint of it, of course. Lorrie, I enjoyed my walk with you in your beautiful corner of the world. Lovely pics. Oh Lorrie, I so enjoyed walking about with you through your nature photographs! There's not a hint of Fall here, but I see glimpses of it through your lens. I also enjoyed reading about the visit with your grands, and seeing the darling skirts and the shirt that you whipped up. Here we are in September and there's subtle changes happening already. The hawthorne berries caught my eye - they'd be great for a fall arrangement. Love that last line! A great description. I want to get out today for a walk about the neighborhood. Love your photos Lorrie. However,it is always difficult to say goodbye to summer. This year I have noticed a number of trees changing in the GTA,(Greater Toronto Area) which is unusual this early in September. Hope it doesn't mean an early winter! Your area does have many touches of Fall color - pretty. Probably will be another month and half or more before any change of color around here. Thanks for stopping by. My daughter always keeps a big supply of beanies made up in all sizes for those cold days. The Grands friends put in special requests also. So loving that last shot of the gorgeous leaves.Signs of Autumn are showing up here too. It's raining today. Oh, what a beautiful, Fall~inspired post, dear Lorrie... And such wonderful captures too...there certainly is so much beauty in Autumn...I love all the crisp reds, browns and golds with the hints of yellos and dark greens! Blessings and joy to you!